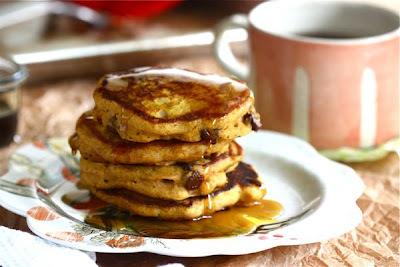 Below is a recipe for pumpkin chocolate chip pancakes. Which, if you know me at all or have read this blog any more than 2 times, you will understand that it is everything I love in one vessel. If homemade pancakes are a little too involved for you, Trader Joe's has the BEST pumpkin pancake mix (just add some chocolate chips to make it even better). I recommend getting some immediately so you can enjoy your lazy Saturday morning even more! Happy weekend!